Shops in England and Wales will not be allowed to open for longer on Sundays, the government has announced. Large stores such as Ikea, Asda and Next had hoped to increase the current six-hour limit on Sunday opening and become deregulated, as in Scotland. But following consultation, Trade and Industry Secretary Alistair Darling rejected their call. The news has been welcomed by trade unions and small shops which had opposed any change in the law. Under the Sunday Trading Act 1994, large shops with a floor area of more than 280 sq m may only open for six continuous hours between 1000 and 1800 on Sundays - excluding Easter Sunday, when they must remain closed. Those campaigning for deregulation argued it would generate an extra £1.4bn for the UK economy. But the Keep Sunday Special campaign said the day should be protected. "With the Sunday trading laws having been in place for many years, it was important that we looked at whether they were still appropriate," Mr Darling said. "Having considered all the evidence from the review, we have concluded there should be no change to the Sunday trading laws." Retailers which have been pressing for extended opening hours expressed surprise at the government's decision. "I think that a lot of retailers and consumers are going to be very cross because it appears that the government has done a U-turn," said David Ramsden, chairman of Deregulate, a coalition of retailers advocating changes to existing laws. But unions representing shopworkers said they were delighted with the outcome. 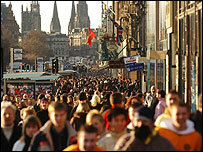 "Britain is the most deregulated retail environment in Europe," said John Hannett, general secretary of Usdaw. "All our members want is the right to a sensible proper work-life balance, and thanks to this wise decision, they will be able to enjoy quality time with their loved ones on Sundays." The Department of Trade and Industry reached its decision after consulting a wide range of interested parties including consumers, businesses and religious groups.